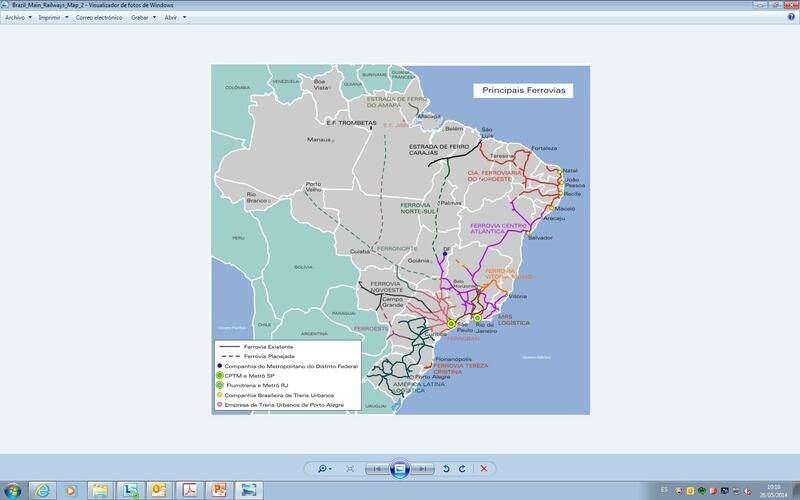 Brazil has undertaken to develop 11,500 kilometres of new freight lines under an open access management model. Under the model, the operator and party responsible for infrastructure must give equal access to various independent, duly authorised railway operators, with the objective of increasing the efficiency of the rail system and optimising infrastructure use. Ineco has been providing support in implementing this since 2014. Tasks include carrying out international benchmarking studies and supporting EPL to define a regulatory and institutional framework. In addition to this, the company has proposed safety standards and regulations for independent railway operators as well as carrying out a study into interoperable railway communication and signalling systems. Furthermore, a cost calculation model of the waterway network (river transport waterways) will also be prepared. These are of great importance for the country due to its size and the volume of freight and passengers transported along them. Brazil has a network of 28,200 km of freight railways, run as a concession, which transports 70% of goods for all freight rail operators in Latin America and the Caribbean. According to data from the Inter-American Development Bank, freight traffic increased by 83% between 1997 (when the private concession system was first implemented) and 2012. The current management model is one of “vertical” concessions; in other words, concessionaires are responsible for both operating and managing the infrastructure. In 2012, the Brazilian government launched its Logistics Investment Program (PIL, for its Portuguese abbreviation), a far-reaching plan to construct 7,500 km of road and 11,500 km of new freight railway lines. This new network has been developed with the new open access management system, whereby different independent rail operators will be able to compete on a single network of infrastructure. Within the framework of the 2014 bilateral collaboration agreement between the Spanish and Brazilian governments, Ineco began to lend support to the state-owned company Empresa de Planejamento e Logistica (The Brazilian Logistics and Planning Company, EPL for its Portuguese abbreviation), which operates under the Ministry of Transport, to implement the new regulatory framework. Ineco also proposed safety standards and regulations for independent rail operators, as well as carrying out a study into interoperable rail communications and signalling systems to enable the network to be managed under an open access model, for both the present and future networks.